Matthew Stafford dropped back and delivered a strike, threading a sharp pass between a lunging linebacker and a blanketing cornerback. 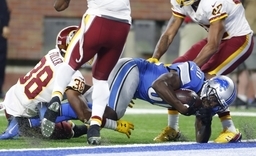 Stafford's go-ahead, 18-yard touchdown pass to Anquan Boldin with 16 seconds left lifted the Detroit Lions to a 20-17 win over the Washington Redskins on Sunday. 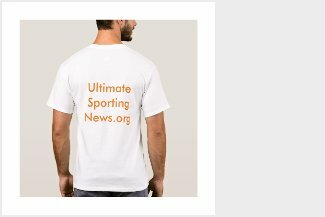 "I cut it loose and I kind thought to myself, `We're going either win the game or lose the game on this one,'" Stafford said. "It was a tight window." The Lions (4-3) have won three straight thanks in large part to Stafford making clutch throws in the final minutes, giving him 24 career wins with game-winning drives in the fourth quarter or overtime. "He does not back down from tough situations," Detroit coach Jim Caldwell said. "He relishes in them." Stafford, who set up game-winning kicks in the previous two games, was 18 of 29 for 266 yards with one TD and no turnovers in the 100th game of his career. "With Stafford, it's never in the bag if it's close," Redskins safety Will Blackmon said. "I call him (Brett) Farve Jr. because those are the kind of attributes and intangibles he has." The Redskins (4-3) had won four straight and looked like they were going to extend their winning streak whenKirk Cousins scored a go-ahead TD on a 19-yard run with 1:05 left. Washington, though, failed to stop Stafford from throwing or running on his last possession and could not overcome mistakes that included turnovers, a missed field goal and penalties. Redskins coach Jay Gruden lamented the scheme his team used to on Stafford's last snap. "We should have blitzed seven or eight," Gruden said. "But we were playing coverage that we've been playing for a long time and guys were comfortable with. (Linebacker) Will Compton missed it by a fraction of a hair." Cousins tried to make up for a lost fumble in the third quarter when he put Washington ahead. He faked a handoff to Chris Thompson, tucked the ball away and ran to the right around the outside to score against a defense that didn't expect him to be carrying the ball in a critical situation. Cousins finished 30 of 39 for 301 yards with a TD and a fumble. "We moved the football," he said. "We were productive in that sense for much of the game and then you have to finish. Every play matters." Both teams lost their top cornerback to an injury during the game. Washington's Josh Norman was knocked out of the game with a concussion, landing hard on his left shoulder after giving up a 52-yard pass to Marvin Jones in the third quarter. Detroit's Darius Slay left the game with a hamstring injury in the second quarter. The Redskins were without standout TE Jordan Reed for a second straight game because of a concussion.Vernon Davis replaced him in the lineup and had season highs with six receptions and 79 yards. Redskins OTTrent Williams had a knee sprain and is scheduled for an MRI on Monday. Detroit's banged-up backfield, which is missing Dwayne Washington (ankle) and Theo Riddick (ankle), created an opportunity for Justin Forsett to play a larger role in his second game with the team. Forsett was given the ball on four straight plays at one point and finished with eight carries for 33 yards and two receptions for 15 yards. Detroit made field goals after each of Washington's lost fumbles, including Matt Jones' into the Lions end zone early in the game. Jones appeared to move down on the depth chart after the turnover as Thompson and Robert Kelley got more carries, but Gruden insisted the starter wasn't benched. "I'm not going to give up on him for fumbling," Gruden said. Detroit's Zach Zenner scored on a 1-yard run midway through the third quarter against a defense that hadn't given up a TD in nine quarters, giving Detroit a 10-3 lead. Stafford completed a 16-yard pass to Golden Tate in the first quarter that bounced off the back of Bashaud Breeland. The Redskins play Cincinnati in London. Detroit hits the road to face Houston after being at home for three straight games.